Homepage. 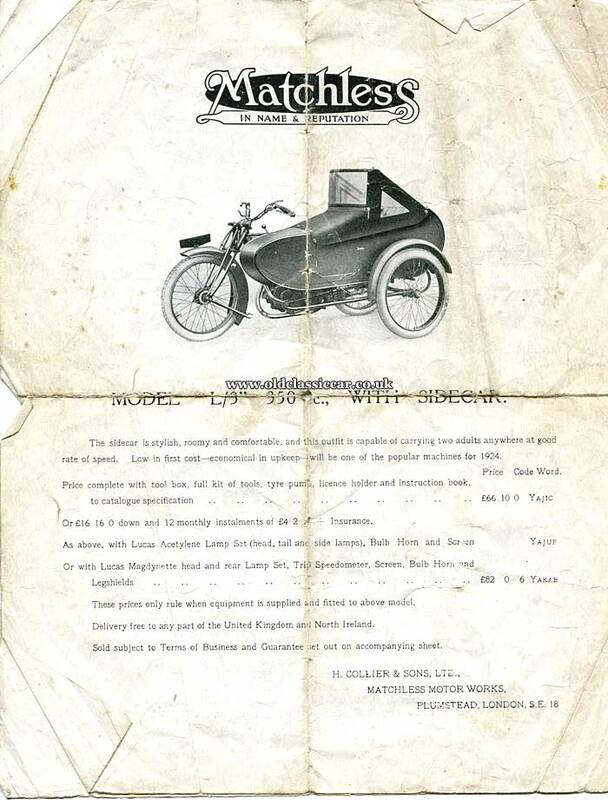 This page: An original sales leaflet from H. Collier & Sons for their 350cc Matchless motorcycle. The condition of this original old sales leaflet isn't great, in fact it's only just about clinging to completeness. But for a measly fifteen pence on eBay, I can't really complain. 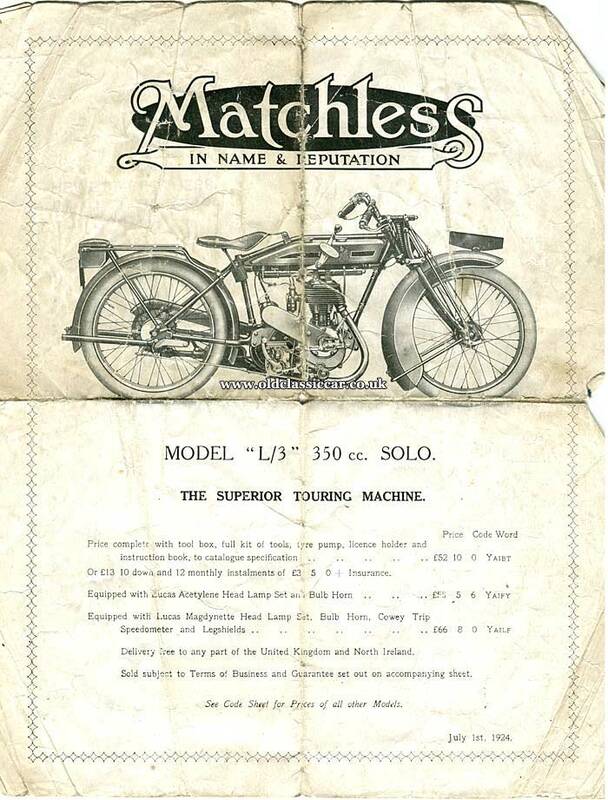 It was produced on behalf of H. Collier & Sons Limited, of the Matchless Motor Works, Plumstead, in London, manufacturers of the Matchless range of motorcycles. 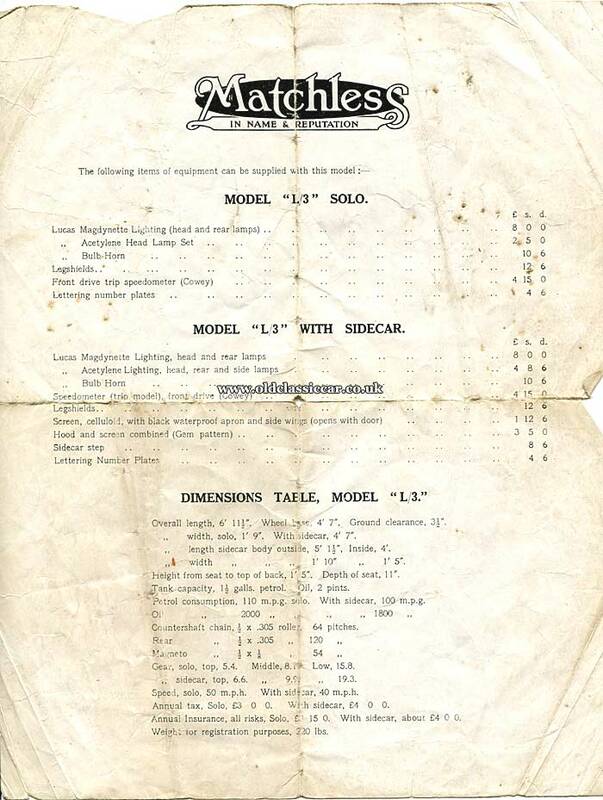 This isn't the first time that Collier & Sons, and their fine range of machines, has featured on OCC, as a few years ago a sales invoice dating to 1928, issued by the firm for the sale of various motorcycle parts, was added in - it can be found here. While not perfect, that ancient invoice has survived in better condition than this leaflet. 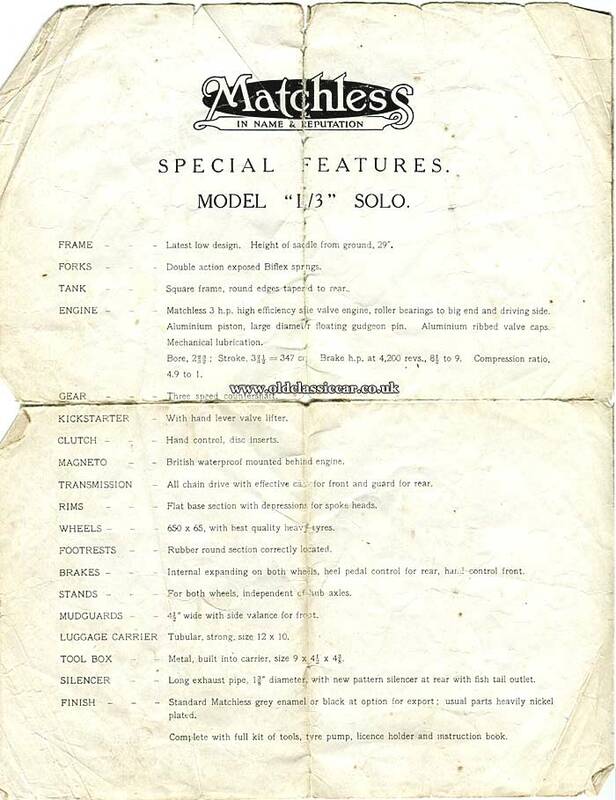 The leaflet is specifically for the Matchless L/3 350cc, in both Solo and Combination (sidecar) form, the L/3 referred to as "THE SUPERIOR TOURING MACHINE". The front page features an illustration of the motorcycle, in Solo guise, along with a list of prices for the bike and accessories. Each purchase option has, cryptically, an associated "Code Word", presumably another way of saying "Reference Number". Options offered included a full kit of tools, a tyre pump, either a Lucas Acetylene or Magdynette headlamp arrangement, Cowey speed & trip meter, legshields, and instruction book. The publication is dated 1st July 1924. Gingerly opening this fragile document reveals, to the left, a list of the L/3's specification, including information regarding the frame, the forks, and its engine, which is described as: "Matchless 3hp high efficiency side valve engine, roller bearings to big end and driving side. Aluminium piston, large diameter floating gudgeon pin. Aluminium ribbed valve caps. Mechanical lubrication." All L/3s were sold in "Standard Matchless grey enamel or black at option for export; usual parts heavily nickel plated." The third printed page continues to list the features of the L3, again with both options for Lucas illumination listed, along with the extra cost incurred if desiring a bulb horn. Details for the sidecar combination alternative then follow, as does a table listing the machine's dimensions, fuel and oil consumption figures, maximum speed (50mph, or 40mph with sidecar fitted), and the cost of road tax. "The sidecar is stylish, roomy and comfortable, and this outfit is capable of carrying two adults anywhere at good rate of speed. Low in first cost - economical in upkeep - will be one of the popular machines for 1924." More items relating to motoring in the olden days may be found in the Motoring Collectables section. While most of the site concentrates on nostalgia relating to the motor-car, there are quite a few references to motorcycles and sidecars.